The performance, here presented in Ambient Stereo XR sound, is eminently listenable and the only misgiving I have is the Met audience’s deplorable habit to clap before the end of a scene, drenching the orchestral postlude. Even after Raimondo’s Dalle stanze, where he relates the horrible things he has seen in the apartment of Lucia and Arturo, just before Lucia arrives and sings her mad scene, there is an attempt to applaud. There are several cuts including the Wolf’s Crag scene, but what interests most potential buyers is no doubt Sutherland’s Lucia and most of her part is retained. The performance doesn’t come off with a very attractive beginning. Enrico is rusty and dry-voiced and Raimondo is elderly-sounding, which by all means is in character with the role. Both singers improve during the afternoon however. But I suppose most listeners that Saturday were just waiting for the second scene, at the fountain in the park of Ravenswood Castle. One can imagine the expectations during the long harp introduction, and when Lucia appears there is some clapping. After the short dialogue with Alisa, Lucia sings softly Ascolta (Listen) and those in the audience who knew the opera were aware of what was to follow: Regnava nel silenzio. Reactions from those who hadn’t heard her early Decca recital: her soft legato! Her easy top-notes! The power at forte! Her coloratura! Her trill! And then the cabaletta, Quando, rapito in estasi. Even more stunning and culminating in a fabulous high E flat, penetrating into every corner of the enormous auditorium! Violent ovations! Well-deserved of course. Edgardo enters and their long duet becomes another highlight, where we also clearly notice the difference of style: Richard Tucker an eminent, versatile tenor, steeped in Verdi and verismo, Joan Sutherland having insight in the bel canto tradition with flexible phrasing and perfect legato. But Tucker also sings legato and adjusts to Sutherland’s phrasing and this is particularly obvious when Lucia first sings Ah! Verranno a te sull’aure marvellously and Edgardo repeats the same phrase in the same manner. Tucker is no Bergonzi but here he is really very good. In the second act confrontation between Lucia and her brother Enrico, Sutherland also demonstrates her dramatic capacity and Frank Guarrera, though not very sophisticated, has an evil snarl and shows a sense of drama. In the next scene, when Arturo is to marry Lucia, we encounter the former for the first time in the short solo Per poco fra le tenebre, and here is a lyric tenor, with youthful timbre and ravishing tone. For God’s sake, it’s Charles Anthony, who sang more than any other singer at the Met, and it’s great to have him documented. I’ll come back to him a little later. The sextet goes well with Sutherland soaring like a welding flame over the ensemble. Edgardo is also at his most dramatic at the end of the scene. But it is the third act and the famous mad scene that everyone is waiting for, and I believe nobody was that afternoon and no one will be today, disappointed at what they heard/hear. There are several recordings of that scene with Joan Sutherland, both in studio and live, and the version recorded on 9 December 1961 is in no way inferior to earlier or later versions. After the first half of the scene the ovations are so enormous that Milton Cross has to come in with a commentary and remind the radio listeners that it isn’t over yet and when the ecstasy has cooled down a bit Sutherland is able to resume the scene and toss off Spargi d’amaro pianto with if possible even greater brilliance. The last scene with Edgardo at the tombs of the Ravenswoods often becomes an anti-climax after the fireworks of the mad scene. That is a pity, since Edgardo’s big solo is one of the great numbers in this opera and, indeed, one of the really great tenor scenes in all bel canto operas. It isn’t a showpiece, but it is an unhappy man who is ransacking his life – a deeply emotional scene. Richard Tucker is at his very best here, singing with both inwardness and glow. Tu che a Dio spiegasti l’ali is beautiful and sensitive and his enunciation of the text, here and elsewhere, is excellent. Sutherland is neither better nor worse in that respect than she usually was – for her the vocalisation was the main issue. We must not forget the conductor, Swiss Silvio Varviso (1924 - 2006), who like Sutherland made his Met debut with this production and became a regular in the house for the rest of the decade. He was something of a specialist in bel canto opera and the conducting here is truly idiomatic. 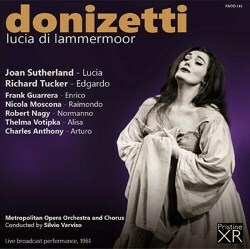 Besides the obvious value of this recording as a document of Joan Sutherland’s conquering the Met in her signature role as Lucia there is also an interesting side-effect in a supporting cast of singers that were all important mainstays on the Metropolitan Opera’s roster for many years. The most legendary of them is possibly the aforementioned tenor Charles Anthony (1929 – 2012). He made his debut in the house on 6 March 1954 in the small role as Simpleton in Boris Godunov. He impressed the audience so much that he was “called forward for three solo bows” wrote the reviewer from The New York Times, and continued: “He did it so well that probably few who saw the performance will forget him” and he rounded off the review: “Mr Anthony had better be careful. If he does other bit parts so vividly, he’ll be stamped as a character singer for life”. Though he sang a few major roles he became the comprimario singer of all time, going on to sing 2,928 performances in 56 seasons and taking his final bow as the Emperor in Turandot on 28 January 2010. The Raimondo of the performance was the Greek born bass Nicola Moscona (1907 – 1975), who made his debut on 13 December 1937 as Ramfis in Aïda and went on to sing 719 performances in a wide variety of roles. His last appearance was they day this recording was made. Mezzo-soprano Thelma Votipka (1906 – 1972), Alisa in this performance, had an even longer career at the Met, making her debut on 16 December 1935 as Flora in La traviata and taking her final bow on 11 May 1963 as Mamma Lucia in Cavalleria rusticana. She sang 1,422 performances, more than any other woman at the Met. Edgardo, Richard Tucker (1913 – 1975), is of course one the legendary Met singers. He debuted on 25 January 1945 as Enzo in La Gioconda (Moscona was Alvise in that performance) and sang his 750th and last performance on 3 December 1974 as Canio in Pagliacci. Baritone Frank Guarrera (1923 – 2007) also had a long career. Making his debut as Escamillo in Carmen on 14 December 1948 he sang in 680 performances until his farewell in the title role of Gianni Schicchi on 8 May 1976. Finally tenor Robert Nagy (1929 – 2008) – here in the small role as Normanno – first sang Giuseppe in La traviata on 2 November 1957 and then during more than 30 years at the Met took a few major roles (Florestan in Fidelio was one) but like Charles Anthony primarily was a comprimario and bowed for the last time on 16 April 1988 after three minor roles in Lulu. In toto he appeared 1,187 times. This last portion of the text is of course totally irrelevant to the review but it is still an interesting coincidence that six of the most frequent singers in the history of the Metropolitan Opera were on the stage at the same time on this very occasion. And how many times did Joan Sutherland appear there? According to The Metropolitan Opera Archives 239, but there are some false entries there. 46 times she was Lucia, her last opera performance was as Leonora in Il trovatore (with Pavarotti) on 19 December 1987 and her very last appearance was a recital with her husband Richard Bonynge at the piano. The encore was Home sweet home. Readers with an interest in opera history, opera nostalgia, Joan Sutherland or just live opera have a goldmine here. The sound is listener-friendly, Sutherland and Tucker are in top form – what more can one ask for?